Sometimes you run across something you just have to have. This happened to me this week. Wanna see what I got? It is the most perfect little clutch/wallet. It holds my credit cards, phone, coupons, and one of those plastic flip book things that I keep frequent customer cards and gift cards in. I don't usually carry a purse, so this is perfect to slip on my wrist and go. You know what makes it even better? The material is plastic-y so I can wipe it down. eek! I love it! You know what makes this post something worth reading and not just a "look what I got" post? I got one to giveaway to one of my fantastic followers. I know it's not my usual crafty giveaway, but it is lovely and my blog name is little lovelies, so it qualifies. Mandatory entry: Be a follower of little lovelies and leave me a comment telling me so. Optional entry 1: Follow me on twitter and leave a comment telling me so. Optional entry 2: Follow little lovelies on facebook and leave a comment telling me so. 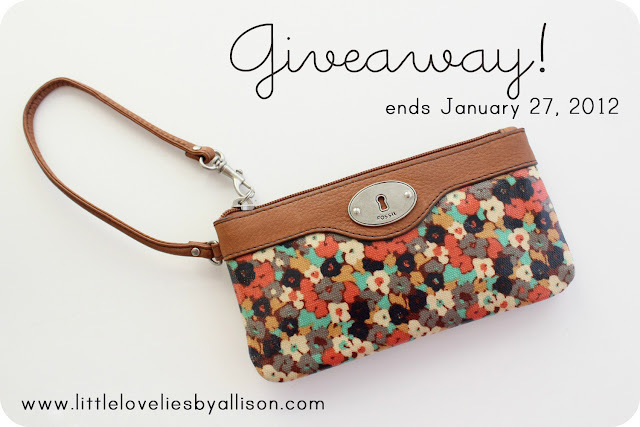 Giveaway ends on January 27, 2012 at 10:00pm CST. Open to anyone - that means you international readers are free to enter! Please make sure you leave your email address in your comment(s) or have it linked to your profile. The winner will be chosen via random.org and announced here on the blog on January 28th. Thanks for being the greatest followers around. I follow your blog, thanks for the giveaway! Oh, and I don't usually carry a purse either. I have a wristlet from 31 and I love it. I would love to win this one from you so I can switch out sometimes. I'm a follower. Thanks for the chance to win. I'm also a FB follower. Thanks for an extra chance to win. liked ya on fb too! i'm a follower - it is cute, thanks! I am a follower of your lovely blog. Thanks for the giveaway. I love this! It's the perfect size and the design is gorgeous! I'm crossing my fingers for this one! I follow you on twitter. tweet tweet. i also follow you on Facebook. fingers crossed...that wallet is darling! that is so cute...would fit perfectly into my diaper bag. am always leaving my license and phone behind. i follow little lovelies! I'm a follower. Would love to win the super cute clutch! Hi, I follow your blog here from Brazil!!!!! And Love it!!!! Love this giveaway!!! God Luck to Brazil!!! Cute little clutch! :) I'm a follower. i follow- and this is adorable! i like your taste- but i already knew that! ... and I like you on facebook! I'm a follower, and the purse is so cute! And I now follow you on twitter too! I follow your blog. Such a cute little wristlet! I see it's big enough for a phone, too! I just became a FB fan, too! I'm a follower! I am! :) And I am so glad! such a perfect giveaway and great for all us over the pond too!!!! I have been reading your blog for a while but only just managed to follow you! How computer savvy aren't I! Also i now like you on facebook. I follow your blog! This is so perfect!!! Cute clutch. I'm a follower of LL blog. This is too adorable. I am a follower! I follow you on titter as intheloop13! I liked you on fb as inthe loop! That is lovely and would be great for my morning walks at the dog park. I hate to bring my purse and hate leaving anything in the car. Thanks for the giveaway! That clutch is so cute! I am a follower! THis is fantasmic! Following via GFC. I don't usually carry a purse either and try to stuff everything in my coat pockets but this looks like a perfect size AND a wrist strap! I am a long time follower of your blog. And I like you on FaceBook- is that the same as following? That clutch is absolutely adorable! Looks so modern and convenient. i already follow you via GFc. Hope that's what you meant. too cute! oh I've been dreaming of this clutch for nearly a month now :-). With the huge diaper bag I have for my twins I don't carry a purse any more and its hard to store my personal items. This would be amazingly helpful. Your blog is fantastic. I'm now a follower. I'm a follower on facebook now! I'm a follower on twitter too.. I am a follower of your blog, and love it! What a precious little purse! I am one of your devoted followers. Have a blessed day! I'm now your very newest follower on Twitter as well. One can never have enough good stuff!! Have a wonder-filled day! I am a follower. Really cute blog by the way. I'm a follower....have been for a while via e-mail!!! Follow via GFC- and love every post that comes to my inbox!! Awesome way to stay up to date with your posts! 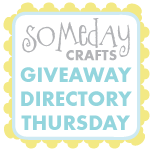 Just discovered your sweet blog thru Kim over at The Craft Room, and I am now a follower! Oh how cute! I follow you on facebook! And I follow you here! I've followed your Blog for a while now on the Google Reader. I'm an official Follower now. Thanks for the Giveaway opportunity. Lovely giveaway - I am a happy follower. I'm now a follower on Twitter. Following your blog via email and loving it! I'm a follower- also email subscribed and have tried out many a craft project- thanks. I'm a follower and I'm in love with that wristlet! I am passionate about this site! I am a follower! and on Facebook! YAY!! Thanks for including us international people :D I would LOVE LOVE to win this little clutch it is adorable. I of course am a follower! I also 'Like' you on facebook, Thanks so much for the giveaway, you rock! I followed little lovlies on Facebook! SO adorable!! I follow your blog. ...and on fb...I'm enjoying your "Pinned it, did it" series. I often think..."must. stop. pinning!!" I think I need to set some boundaries. Like I have to do at least 1 pin every day, or at least 1 for every 5 I pin. Something like that. :) Thanks for the inspiration! Thanks for the super cute giveaway, and thanks for including us International Folk ;). I follow you. I'm a follower and I love that bag! I follow you, and these are indeed adorable! Im following your blog now! these are adorable! I'm a follower and I follow you on FB and Twitter. I just stumbled across your website! I am so excited as I have recently started cross-stitching. I am a fan! I'm adding you to my Facebook 'likes' and to my blog roll. I'll be back! I follow your blog! Thanks so much for the chance to win! Such a cute little wallet! I 'like' your fb's page! Just found your blog today and absolutely love it. I am following on Twitter. Thanks for the chance! I follow you on facebook now too! I'm a follower of this wonderful blog! I just found your blog via Victoriana Quilt Designs, and I had to sign up to follow you - LOVE your site and all the little lovelies on it! I knit, crochet, quilt, make cards... I have a feeling that I'm going to find lots of inspiration on your site! I'm a follower! And I just love that little clutch. I'm a follower!! And I just love this giveaway!